Eberhard Nestle, D.D., editor of the well-known Stuttgart Pocket Edition of the Greek New Testament, began just before the outbreak of the Great War, at the request of the Württemberg Bible Society, to prepare a pocket edition of the Greek Old Testament (Septuagint) as well. His death in 1913, however, prevented this object from being fulfilled. In order to preserve a specimin of E. Nestle’s work, his unfinished edition of the book of Jeremiah, with parallel Greek and Hebrew texts, was rounded off and published by his son, Studienrat Erwin Nestle, D.D.Ph.D., in collaboration with Pastor Johannes Dahse. 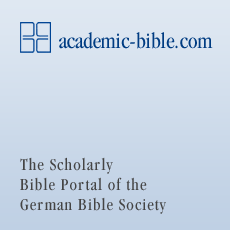 The Württemberg Bible Society did not, however, abandon the idea of publishing a pocket edition of the Septuagint, but sought for an additional editor. Thus it came about that in the last year of the War, 1917 to 1918, Rahlfs agreed to take over the task of editing this pocket edition. By then he had already for a long time been engaged in Septuagint research, having been for nearly ten years Director of studies in the Septuagint at the “Gesellschaft der Wissenschaften” at Göttingen. While occupying this position, he had the task of producing a large critical edition of the Septuagint. As it was, however, impossible, owing to the outbreak of the Great War, to make the necessary completions to the collection of photographs of the Manuscripts, the editing of this large work had to be temporarily postponed. Hence, the idea of producing a small critical edition instead of the larger one found the approval of the Göttingen Septuagint Commission. The post-war period brought all kinds of obstacles in its train, and it was not until 1922 that a specimen section of this small edition was published, by commission of the Department of Septuagint Research: “Das Buch Ruth griechisch, als Probe einer kritischen Handausgabe der Septuaginta herausgegeben von Alfred Rahlfs”. After this had appeared, Rahlfs set to work upon the preparation of an edition of Genesis, which was published in 1926 under the title of “Septuaginta Societatis Scientarium Gottingensis auctoritate edidit Alfred Rahlfs”. This volume, as well as the edition of Ruth, was published by the Württemberg Bible Society’s Press. The considerations which had to be taken into account in the textual criticism of Genesis proved entirely different from those concerning Ruth, and the critical apparatus extended further in the case of the former than in that of the latter. Thus the edition of Genesis assumed a form midway between that of a pocket edition and that of the larger edition which had been previously proposed. There was at first a ready sale for this edition of Genesis, but it happened that, when only about a quarter of the edition had been disposed of, its sale came to a standstill. Consequently, when the manuscript of the Psalms, which should have come next in the order of publication, was nearing completion, the Bible Society declared that future issues could not be permitted to assume as full a form as that of the edition of Genesis. At the same time, the “Gesellschaft der Wissenschaften” once more gave consideration to the possibility of the publication of the larger edition. As a consequence of this, the Bible Society resumed its original plan of publishing a small pocket edition Subject to the approval of the “Gesellschaft der Wissenschaften”, he declared hisself willing to prepare a pocket edition on the textual basis of the three oldest Greek manuscripts. Thus the scheme was abandoned which had for a time been contemplated, of combining the pocket edition with a larger edition. There upon the Göttingen firm of Vandenhoeck & Ruprecht undertook the publication of the larger edition. In 1930–1931 they published his edition of the Psalter, which was originally intended for publication by the Bible Society, but which had, meanwhile, been still further enlarged, and now appeared as Part X of the big work. This full edition is designed for detailed study, and is intended to cover all available material. The pocket edition confines itself, in the main, to the three most important manuscripts, B,S, and A, and refers only incidentally and where it seems needful to other material. The aim of this work is to provide clergy and students with a reliable edition of the Septuagint at a moderate price, and thus to supply an important companion and aid not only to the study of the Old Testament, but also of the New Testament.